On February 20 "Sorry", the second single from Madonna's Confessions From The Dancefloor album, is released. It contains a remix by the Pet Shop Boys, "Sorry (PSB Maxi-Mix)", in which Neil's voice intermingles with Madonna's, and reaches number one in the British charts. That same month, Neil presents Madonna with her Best International Female Solo Artist award at the Brit awards. In her acceptance speech she declares: "It's ironic because even though I'm an American recording artist, it is British recording artists who have influenced my work the most., from David Bowie to Elvis Costello, Portishead to Radiohead, the Pet Shop boys to Goldfrapp…"
On May 8 "I'm with stupid", a song "about Bush and Blair, comparing them to somebody with an apparently stupid partner", is released as a single. "The main point, though," Neil explains, "is the line 'Is stupid really stupid? Or a different kind of smart?" The video features actor-comedians David Walliams and Matt Lucas, longtime Pet Shop Boys fans most famous for the BBC comedy series Little Britain, playing the Pet Shop Boys in a low-rent musical after having kidnapped their inspiration. 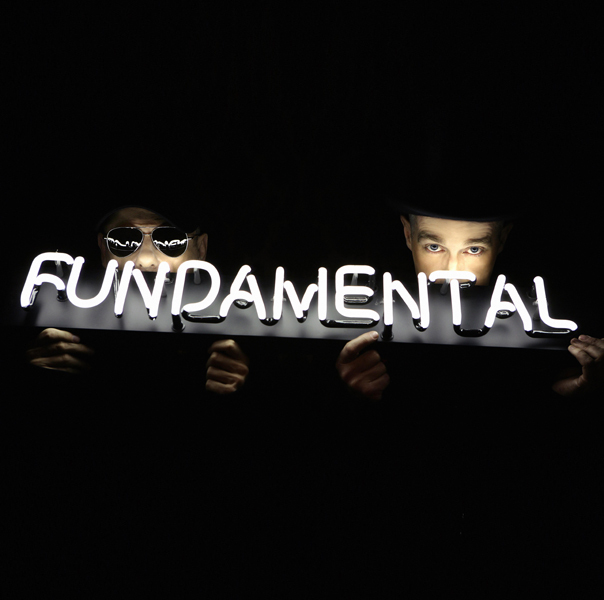 On May 22 they release a new album, Fundamental, produced by Trevor Horn. "We had the title before we ever started making the album. It originally comes from the endless discussions of fundamentalism that we live through at the moment. As ever with an issue like that, we related it to what we do, and we wanted to make an album that was very electro, that was fundamentally Pet Shop Boys….The idea behind the lyrics was to take contemporary events and put them into songs that are apparently about interpersonal relationships." On June 15 the Fundamental tour begins at the Skein Sommerfestival in Norway. The innovative show, designed by Es Devlin who designed the musical Closer to Heaven, is centred around a giant cube which can be unfolded, and inhabited, in a multitude of ways. On July 24 "Minimal" is released as a single: "The words of the song are simply about miniminalism". Its video is the closest to a straight performance video the Pet Shop Boys have ever made. On September 18 Chris returns to his old school, the Arnold School in Blackpool, to be shown round the school and open some curtains to reveal a plaque to mark the opening of their new music facility, the Lawrence House Music Centre. On October 23 Robbie Williams' Rudebox album is released. It includes two Pet Shop Boys productions, "She's Madonna" and "We're the Pet Shop Boys", the former also co-written with them. This collaboration was sparked when Chris bumped into Robbie Williams a couple of years earlier and they discussed forming a supergroup: Robbie Williams, the Pet Shop Boys and a never-decided fourth person. 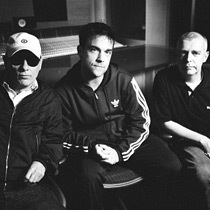 Nonetheless they met up to write and record "She's Madonna", and Robbie Williams subsequently decided to cover My Robot Friend's "We're the Pet Shop Boys" by singing over the backing track from the Pet Shop Boys' version of the song. On October 15 "Numb" is released as a single. The song was written by American songwriter Diane Warren and was originally recorded as a potential single for PopArt. It had received some unexpected exposure a few months earlier when the BBC used it as the soundtrack to the from-triumph-to-heartbreak video montage traditionally broadcast after the England football team’s inevitable exit from major football tournaments … in this instance, the World Cup. The Pet Shop Boys’ new single edit was partly inspired by the way the BBC had edited the song. On October 23 the live album Concrete is released. It documents a one-off concert at London’s Mermaid Theatre on May 8 (which had been broadcast by Radio 2 in an abridged form on May 27), and includes guest performances by Robbie Williams ("Jealousy"), Rufus Wainwright ("Casanova in hell") and Frances Barber ("Friendly Fire"). It features the BBC Concert Orchestra and a band led by Trevor Horn that included Anne Dudley, Steve Lipson and Lol Creme. Opera singer Sally Bradshaw also reprises her vocal from the original album version of "Left to my own devices". On October 23 A Life In Pop is released. This DVD contains a longer version of the Pet Shop Boys documentary directed by George Scott that had first been broadcast on Channel 4 on May 24, and which included interviews with Robbie Williams, Jake Shears, Tim Rice-Oxley, Brandon Flowers, Trevor Horn, Frances Barber, Matt Lucas and David Walliams amongst others. "There's a brilliant bit at the start where Chris comes out of the floor in the Blackpool Tower Ballroom playing 'It's a sin' on the organ," Neil notes. 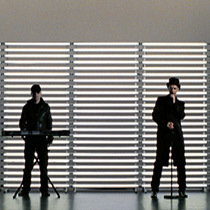 The DVD also includes videos for the previous five Pet Shop Boys singles and three memorable archive performances: at the 1988 Brits with Dusty Springfield, at the 1994 Brits with the miners, and their first-ever TV performance, playing the Bobby O version of "West End girls" on the Belgian show Hit Des Clubs. On October 23 a compilation album, Pop! Justice: 100% Solid Pop Music, put together by the popjustice website, is released. It includes the previously-unreleased new version of "It’s a sin" which the Pet Shop Boys performed at their Barfly concert. 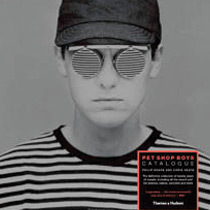 Catalogue, a lavish, large and meticulous Thames and Hudson book documenting the Pet Shop Boys' visual history from 1984 to 2004, edited and written by Philip Hoare and Chris Heath, is published. On December 31 the Pet Shop Boys are scheduled to appear outdoors beneath Edinburgh castle as the centrepiece of the city’s Hogmanay celebrations. That evening, due to poor weather and high winds, the concert is cancelled: “Portaloos were being blown down Princes street”. Some consolation was offered by the discovery that the orchestral opening of “Numb” could be heard accompanying the fireworks at Sydney’s New Year spectacular.